Declaration of War. Newspaper article pasted into Diary of Annie Louise Brush, 1917–1918. Greenwich Historical Society, William E. Finch, Jr. Archives. Gift of Robert and Donna Weltz. For years before America's entry into the War, Germany felt threatened by the United States due to its wealth, unrivaled food production and prolific arms production. These munitions manufacturers included Remington Arms Company, whose owners and administrators lived in Greenwich with a factory located in nearby Bridgeport. Beginning in 1914 the English naval blockade of German ports made it nearly impossible for American companies to ship products to the Central Powers. Thus the United States became a de facto enemy when it only could supply the Allied Powers. 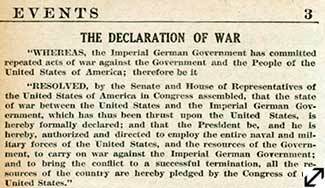 The United States' participation in World War I was not caused by one event, but rather by an escalation of tensions. President Wilson couched America's entry in the loftiest of terms: "The world must be made safe for democracy." In his words the United States would join no mere territorial squabble among nations, but rather a war of good versus evil, one that would allow American ideals to thrive internationally. 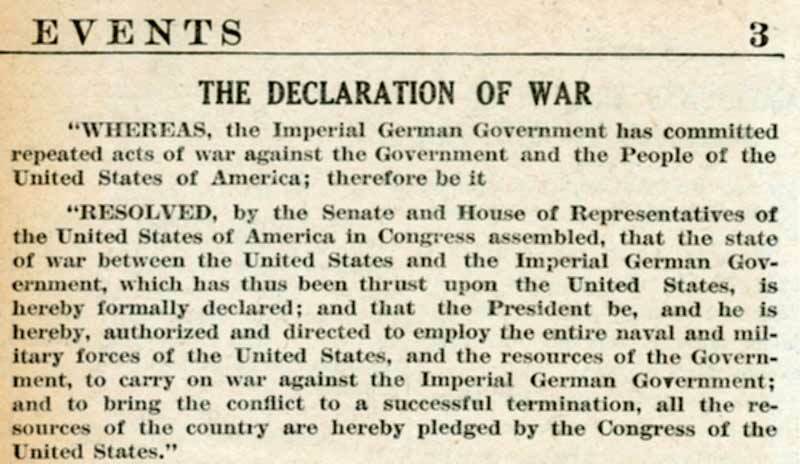 The United States formally declared war on Germany on April 6, 1917. Once the United States entered the War, the government clamped down on any anti-war dissent. Americans' civil liberties, including the right of free speech, were curtailed by the Espionage Act of 1917.